Blogger favorite Steve Gambrel shows off his latest, above, a glorious NYC apartment located in a 1895 building. 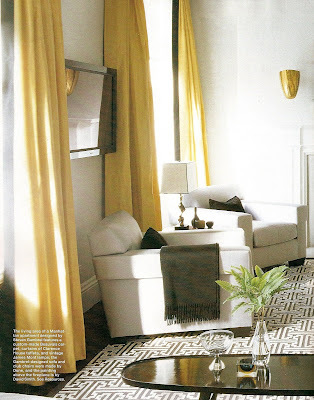 Two standouts are pictured here: the custom Troy rug and the yellow Clarence House silk drapes. Do NOT miss the custom brass art lights which become sculptures in Gambrel's hands. And another not to be missed, the master bedroom closet. Any man would die for a closet this gorgeous. Gambrel's success here shows how he takes something utilitarian and turns it into art. But my favorite story in the Elle Decor, possibly of the year, is Alex Papachristidis' Manhattan apartment. 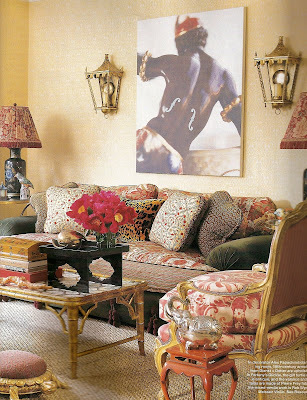 A riot of color, pattern, art and exotic "Grand Tour souvenirs" - the home is cluttered perfection. Fortunys, ikats, and antique suzanis coexist as if they were taupe and cream linens instead of vibrant reds, pinks, yellows, and greens. There are enough up-to-the minute trend alerts here that it's obvious the space will be outdated next year. But still, I'd spend a year here, living quite happily. 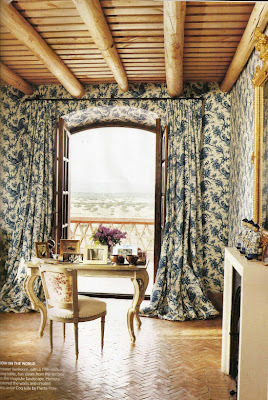 The star of this issue is Carolina Herrera, Jr. and her husband's Spanish estancia, pictured above. If this shot of their bedroom doesn't send you out rushing to see more, we definitely have different perspectives! That's ok, I guess, but how can you not love a room with a balcony overlooking a view such as this, the Pierre Frey Le Coq toile, an antique dressing table, the beamed ceiling and terra cotta floor along with a fireplace thrown in just for pure romance? Heaven! I gave it a go Joni but the major Barnes and Noble in Atlanta tells me to look for Vogue Living around Oct. 17 or 18 -- thanks for tiding me over! Thanks for the preview Joni...I can hardly wait until these arrive at the Canadian Newstands. I am loving the yellow Clarence House silk draperies. I can't stop reading my ED this month. There's so much in it to absorb. Funny how some issues leave you wanting more and seem to have little content of interest, but others (actually all recent issues) are packed to the brim with decadent visual candy. They've been far exceeding my expectations. That postman better deliver these to me ASAP!! 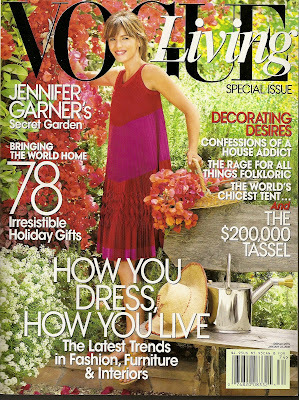 Doesn't "Vogue Living" come with the subscription to Vogue? Thank you, for these wonderful reviews, Joni! Thanks for the comments everyone! I know what you mean, some months a magazine is well - ok, hmmh - that was boring and then other months you can't put it down. I wanted to scan all the images but I think most people would rather see it on paper. So, it's just an appetizer to a greater meal. Yes, thanks for the tip, I will scout out a copy for sure! 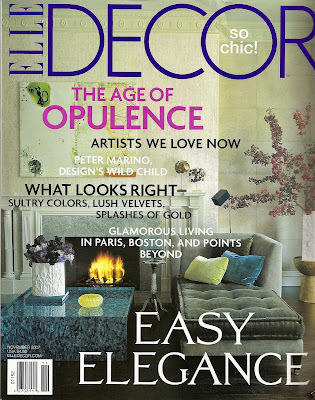 Joni, I absolutely agree, Elle Decor just seems to get better and better, and this month was certainly no exception. The highlights for me were Frank Roops apartment (j'adore it all), and Steven Gambrel has done it again..that NY apartment was stunning - who else could make black patent leather look so suave?